While here on your golf break in Spain, you’ll most definitely want to venture outside of your hotel at some point and discover the local bars and restaurants. Our golfers often ask us where the best places to eat and have a drink are, especially if it is their first trip to the Costa del Sol. So below, we present you with a few suggestions to what we believe are some of the best bars, restaurants and places to hangout and have a good time while here on the Costa del Sol. Although there are many places to eat and drink along the coast, we have focused on three of the main tourist towns, which are Fuengirola, Benalmadena and Marbella & Puerto Banus. Fuengirola is one of the most popular towns on the Costa del Sol offering not only a fantastic golfing experience, but also a great choice when it comes to nightlife and eating out. 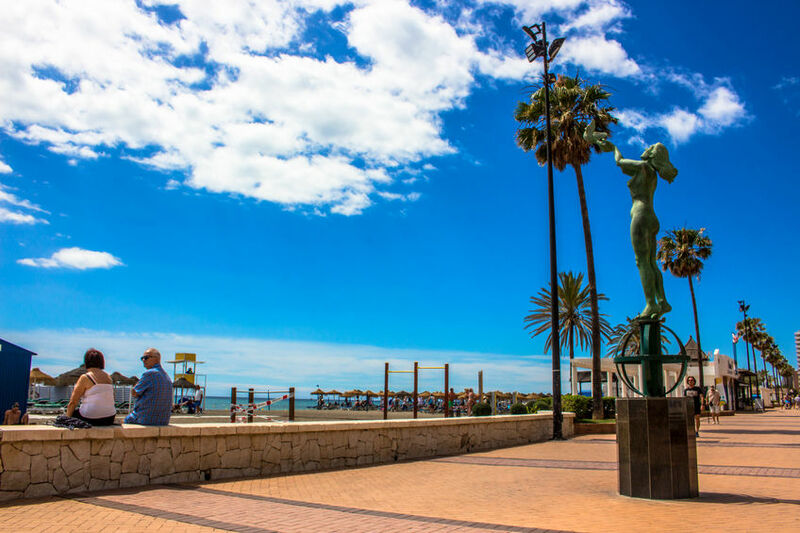 Fuengirola is one of our favourite locations here on the coast and popular among tourists due to its large array of shops, bars, restaurants and its famous seven kilometre golden sandy beach. It also has its very own zoo (Bioparc Fuengirola), which is located slap bang in the very center of this bustling town. Running parallel to the seafront, Fish Alley or its official name Calle Moncayo is the place to head to in the evening if you are you looking for a great choice of bars and restaurants. However, don’t let the name fool you! You won’t only find fish restaurants here. 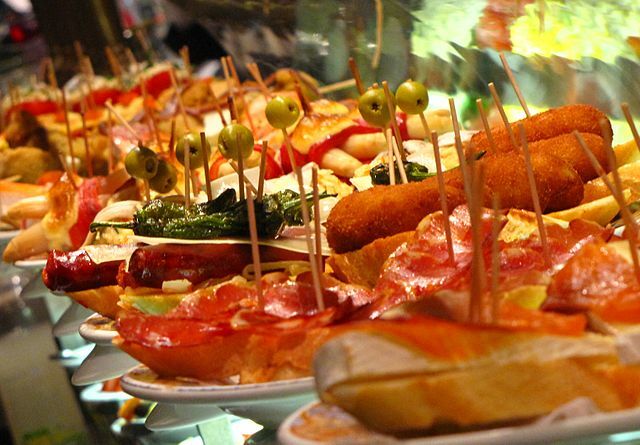 You will also find a multitude of restaurants serving a wide range of mouth-watering international dishes including Indian, Chinese, Argentinian, Thai, Italian, English Fish and Chips and of course, traditional Spanish fare such as Paella and Tapas. If you like live music, then the Moochers Jazz Cafe may be the place for you offering live jazz music seven nights a week. There is also a rooftop garden where you can enjoy the music while eating a tasty range of local and international dishes. At around one kilometre in length, Fish Alley also offers a number of bars where you can sample a wide variety of local beverages while watching the sun go down including The London Pub, Tramps and Foreplay Bar. Alternatively, you may want to take a wander along the lovely Fuengirola seafront where you can try one of the many Chiringuitos which serve fresh local fish and authentic Spanish food. Lastly, if you are up for a meal followed by some shopping, you may want to try the Miramar shopping centre (Centro Comercial Miramar) just off the N340 motorway. Here you will find a fantastic range of designer shops as well as a number of bars, restaurants and fast food outlets such as Burger King, KFC and Foster’s Hollywood among others. View our current selection of golf offers in Fuengirola. 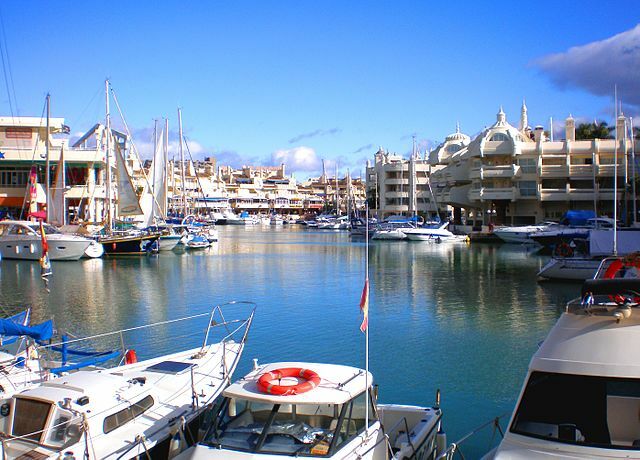 Benalmadena Marina or ‘Puerto Marina’ is one of the most popular tourist destinations on the coast and rightly so. It’s actually won the ‘Best Marina in the World’ award on several occasions. Not only is the marina full of top-notch bars and restaurants, it’s also a great place in which to take a stroll while admiring the huge number of expensive super-yachts on display. 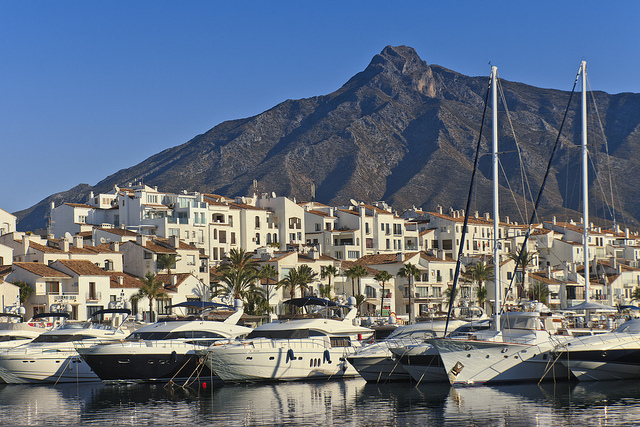 The marina is open 24 hours a day, so whether you are looking for an afternoon snack or looking to party the night away, Benalmadena Marina should definitely be on your itinerary while on your golf break. Some of the best restaurants to try are Gringo’s where you can saver some of the best Mexican dishes on offer as well steaks and Texan style hamburgers. If Italian is your thing, the Trattoria La Parolaccia is a great choice and offers an excellent range of authentic pizza and pasta dishes. The restaurant’s lounge also provides you with lovely views to the marina from the lounge. Another Italian favourite is the Metro Ristorante which is located on the main walkway of the marina. The restaurant offers a huge variety of pizza and pasta all of which can be enjoyed on its open outdoor terrace overlooking the marina. If you want to tuck into a juicy steak, then the Angus Restaurante will be up your street. Here you will find the real taste of Argentina with imported steaks prepared over a charcoal grill by an expert BBQ chef. If you are looking to sample some classic Spanish dishes, then Restaurant Toro will be for you. There are many more great restaurants in the marina. Have a stroll and you will find yourself spoilt for choice. You can view our selection of golf breaks in Benalmadena here. When it comes to eating out, Marbella has great appeal and is a firm favourite with both tourists and locals. As Marbella is a fairly large town, there are many choices when it comes to finding a great place to eat. Here you will find a wide range of restaurants serving both local and international cuisine. Although not strictly speaking in Marbella and just a short drive away, Olivia’s in La Cala de Mijas is a good choice and sits right on the seafront of this popular town. The restaurant can be seen on television quite often as it is owned by The Only Way Is Essex celeb, Mark Wright. A great opportunity to do some celebrity spotting no doubt! Daytona Motor Passion Bar & Grill is a firm favourite with locals and anyone who considers themselves a ‘petrol head’. The restaurant is located next to the cinema in chic Puerto Banus and offers a wide selection of Italian food including pizzas, pastas, antipasto, salads and also burgers and food from the grill. Inside the restaurant you will find a retro motorbike and car theme throughout with old motoring memorabilia on display. Another favourite in Puerto Banus is the well known La Sala restaurant which was first opened in 2010. The restaurant offers a great selection of food including local and international dishes, which you can enjoy while listening to the live music which is available throughout the week. The rear terrace boasts stunning views to the local La Concha mountain which you can savor while sipping a cold cocktail. Or you may want to try the front decked terrace where you can have a drink and watch the world go by. There are also many Chiringuitos dotted along the Marbella beautiful seafront where you can tuck into some local snacks while watching the sun go down!! For a range of golf breaks in this area, see our Marbella golf offers page.